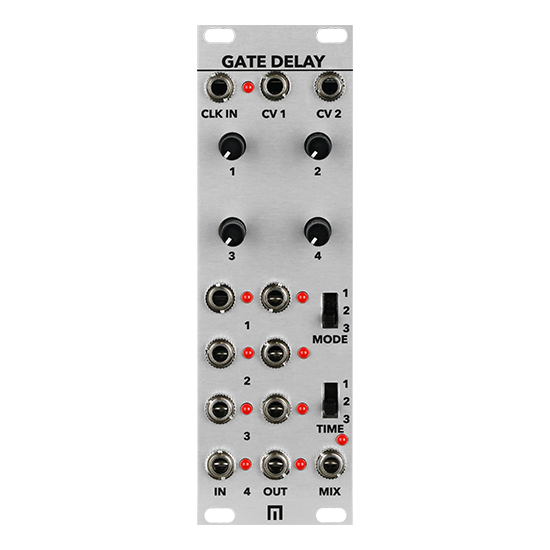 The Quad Gate Delay is a 4 channel tempo-synced rhythm generator and logic delay. 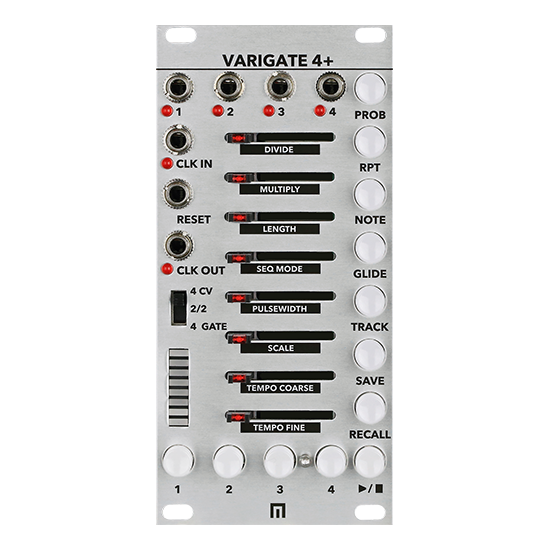 There are 3 switchable time modes: milliseconds, tempo synced (unquantized), and tempo synced (quantized) with additional manual control over each mode as well as CV inputs over channels 1 & 2 (3 & 4 are fixed). 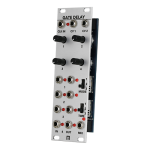 The first mode allows for up to 1 second of delay per channel. Tempo synced (unquantized) allows for up to a bar of delay based on the incoming clock. Tempo synced (quantized) mode allows for up to a bar of delay quantized to 1/16 divisions. There are 3 normalling modes. In the first mode all inputs only trigger their own channels. 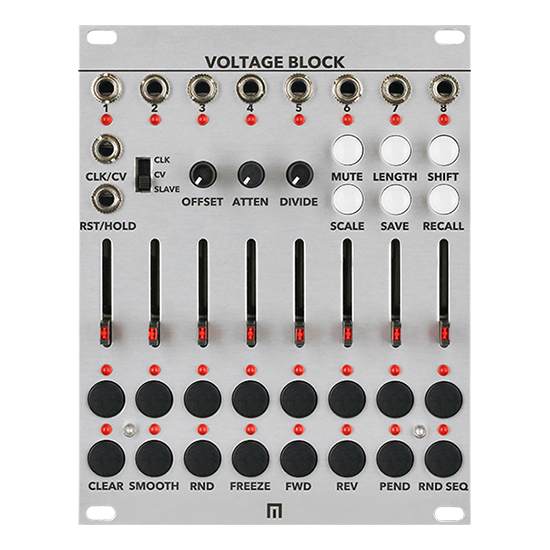 In the second mode the first input will trigger all channels at the same time which allows for multiple taps off of a single trigger. The third mode sends the delay output from the current channel into the next channel’s input. The mix output combines all 4 channels and sends a short pulse any time one of the outputs goes high. Read more below! 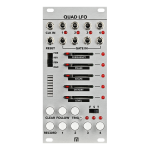 The Quad Gate Delay is a 4 channel tempo-synced rhythm generator and logic delay. 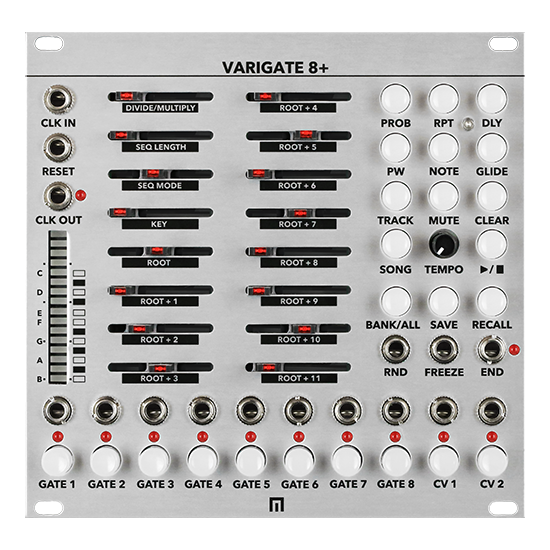 There are 3 switchable time modes: milliseconds, tempo synced (unquantized), and tempo synced (quantized) with additional manual control over each mode as well as CV inputs over channels 1 & 2 (3 & 4 are fixed). 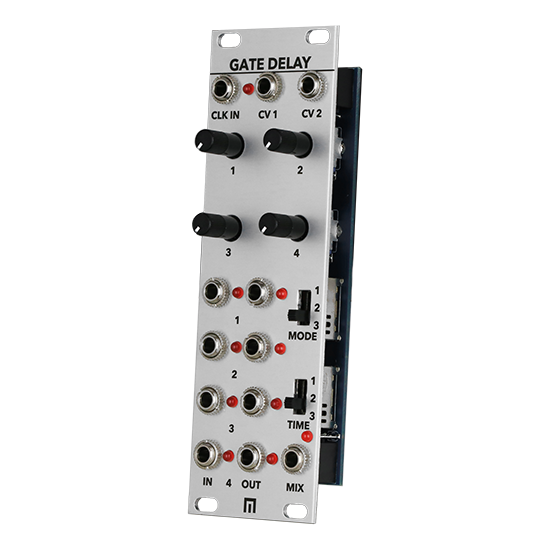 The first mode allows for up to 1 second of delay per channel. Tempo synced (unquantized) allows for up to a bar of delay based on the incoming clock. Tempo synced (quantized) mode allows for up to a bar of delay quantized to 1/16 divisions. There are 3 normalling modes. In the first mode all inputs only trigger their own channels. In the second mode the first input will trigger all channels at the same time which allows for multiple taps off of a single trigger. The third mode sends the delay output from the current channel into the next channel’s input. The mix output combines all 4 channels and sends a short pulse any time one of the outputs goes high. 2 CV inputs for adjusting time of channels 1 and 2. Channels 3 and 4 are fixed.